The NJ market is notorious for wicked and crazy winters, damp and crazy springs, hot and humid summers and beautiful, yet wet falls. Put this all together and it makes pretty unstable conditions for your asphalt parking lot. 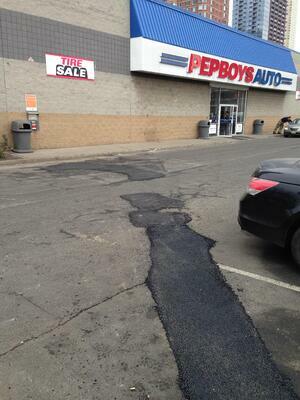 Potholes and unexpected asphalt repairs can surface at anytime during these beautiful seasons. Remove & Replace; Infrared Repairs and Throw & Patch. In the remove and replace option, (sometimes referred to asphalt patching) the damaged existing asphalt or pothole saw-cut and the damaged existing asphalt is removed. Hot-mix asphalt is then re-installed and compacted with a vibratory roller. The seam is sealed with a hot-rubberized crack sealer to prevent water infiltration. 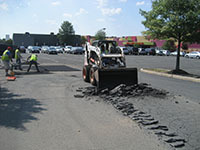 Infrared asphalt repair is a very cost -effective method for repairing existing asphalt in NJ. This repair method has gained popularity in the last decade due to its versatility and environmentally friendly alternative to R & R, remove and replace. **It is important to note, this is NOT designed for every type of repair in NJ, specifically remediating base failure. **It is also NOT designed to repair asphalt which has base failure. Infrared repair is ideal for potholes, bad oil spots, low spots / high spots, settling around utility structures, trip & falls hazards, sunken utility repairs and more. 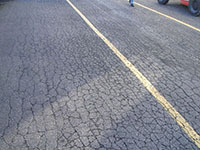 Throw and patch (sometime referred to as skin patching) is an economical option for either emergency or cost-effective asphalt and pothole repairs. 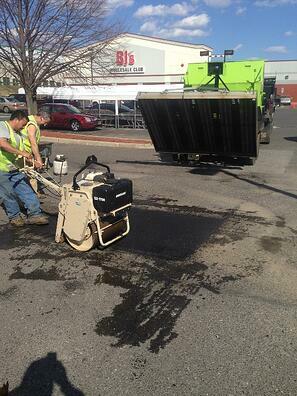 Throw and patch is typically used when potholes need to be filled immediately. It is sometimes completed before milling and paving a parking lot to remove tripping hazards. As a final option it can be used when your budget is not sufficient to complete Remove & Replace Asphalt Repairs or Infrared Asphalt Repairs. Throw and patch stretches your budget. It allows us to fill more potholes holes per dollar. This is because we do not have to complete any excavation work nor do we have to wait for the infrared machine to heat up. **It is important to note, that our specialized sales and customer service representatives can help you stretch your budget. It is important to note that every asphalt job is different, if this is the first pothole or your 100th pothole we are here to help FIX YOUR ASPHALT today! Potholes are formed due to fatigue-cracks of the asphalt surface. As fatigue-cracks develop, they typically interlock in a pattern known as “alligator cracking”. The chunks of asphalt between these cracks become loose and form a pothole. The formation of these asphalt potholes is made worse when the temperature drops. As water enters it, it freezes and puts more stress on the cracked asphalt. If a pothole fills with water the growth may be accelerated, as the water ‘washes away’ loose particles of road surface as vehicles pass. If they become large enough, damage to tires and vehicle suspensions can occur. Alligator Cracking is a series of interconnection cracks caused by fatigue failure of asphalt concrete surface under repeated traffic loading. Cracking begins at the bottom on the asphalt surface (base) where tensile stress and strain are highest under a wheel load. The cracks start out as a series of parallel longitudinal cracks. After repeated traffic loading, the cracks connect, forming many-sided, sharp-angled pieces. Eventually developing into a pattern resembling the skin of an alligator. Alligator cracking occurs only in areas subjected to repeated traffic loading, such as wheel paths.Alligator cracking is considered a major structural distress and is often accompanied by rutting.This type of distress often will have two or three levels of severity often within one distressed area. If these portions can be easily distinguished from each other, they should be measured and recorded separately.